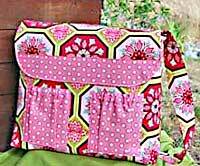 The Lucky BabyDiaper Bag pattern by Wired Up Designs is making a convertible diaper bag which can be worn either slung over the shoulder or across the back for hands free comfort! There are instructions for lots of pockets inside and out and matching changing pad directions are included. Finished size is 15" wide x 13" high x 5" deep.